Theophrastus of Eresus in Lesbos, born about 370 BCE, is the author of the most important botanical works that have survived from classical antiquity. He was in turn student, collaborator, and successor of Aristotle. Like his predecessor he was interested in all aspects of human knowledge and experience, especially natural science. His writings on plants form a counterpart to Aristotle’s zoological works. 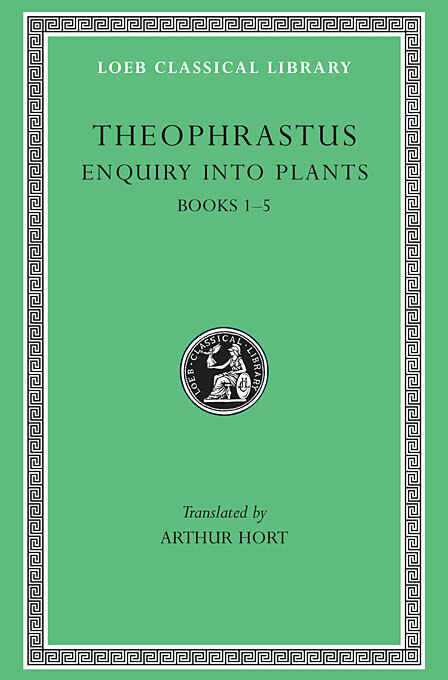 In the Enquiry into Plants, Theophrastus classifies and describes varieties—covering trees, plants of particular regions, shrubs, herbaceous plants, and cereals; in the last of the nine books he focuses on plant juices and medicinal properties of herbs. The Loeb Classical Library edition is in two volumes; the second contains two additional treatises: On Odours and Weather Signs. In De Causis Plantarum, Theophrastus turns to plant physiology. Books 1 and 2 are concerned with generation, sprouting, flowering and fruiting, and the effects of climate. 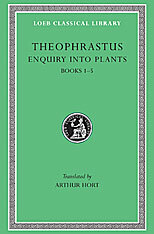 In Books 3 and 4, Theophrastus studies cultivation and agricultural methods. In Books 5 and 6, he discusses plant breeding; diseases and other causes of death; and distinctive flavours and odours. Theophrastus’s celebrated Characters is of a quite different nature. This collection of descriptive sketches is the earliest known character-writing and a striking reflection of contemporary life.